Classroom Tools.com - Warm-up activities - What's That?! Write the list from the box above where it can easily be seen by your students, or duplicate it on strips of paper and distribute them to your class. Explain that the list is a set of ingredients that make up a common product. Ask your students to review the list and to try to determine in their own minds what it might be. Instruct them to raise a hand when they have an idea, and can explain the clues they followed that led them to their identification. If you think that asking them for a specific product might be too difficult, try asking them to identify the type of product (bread or cake, beverage, condiment, etc.). Call on students in the order they've raised hands. Try to reach a class consensus on the product's identity. Once the class has reached a consensus, or deadlocked, explain that the list contains the ingredients (from the largest to the smallest component) that make up the sauce found on a McDonald's Big Mac. Lead a discussion where the class identifies a procedure that can be used to identify a food product when one only knows its ingredients. You may also want to explore the individual ingredients - what they are and the role each plays in the final product. If you choose, assign each student an ingredient to research before the discussion. A wonderful source for use with chemical additives is the Center for Science in the Public Interest's Chemical Cuisine. CSPI also provides a list of food additives to avoid, as well as very good information about sugar, one of the more common additives. Another good source is the Food Additive Search Engine provided by Woolworths. "Natural flavor" is an interesting ingredient. For a fascinating discussion of it (and other things), read Eric Schlosser's Why McDonald's Fries Taste So Good in the January 2001 issue of The Atlantic. An online version is available here. The article is adapted from Schlosser's book Fast Food Nation: the Dark Side of the All-American Meal (Houghton Mifflin 2001). Schlosser discussed his book on Fresh Air (1-22-01) and The Connection (2-7-01). If you have the Real Player installed for your browser, you can hear him by following the links that will appear in the windows that open when you click on the show dates in the previous sentence. You can also read an interview with Schlosser from The Nation's web site. For more on french fries, see Malcolm Gladwell's The Trouble with Fries. Click here for a list of additional reading suggestions. If this went well, try it again with the list of ingredients from some other product. Virtually all processed foods in U.S. markets contain ingredient lists as part of their packaging. In addition, some of the fast food chains provide ingredient lists on their web sites. Others provide nutrition information. Some provide both. Here are links to what's available. Once you've explored the ingredient lists for a number of processed food products, your students might get the idea that they are full of dangerous and/or unhealthful things. Breyer's Ice Cream played to this fear in a series of television ads where very young children stumbled while reading the lengthy lists on competitor's products; while the short, uncomplicated list of Breyer's "natural" ingredients proved easy for them to read. 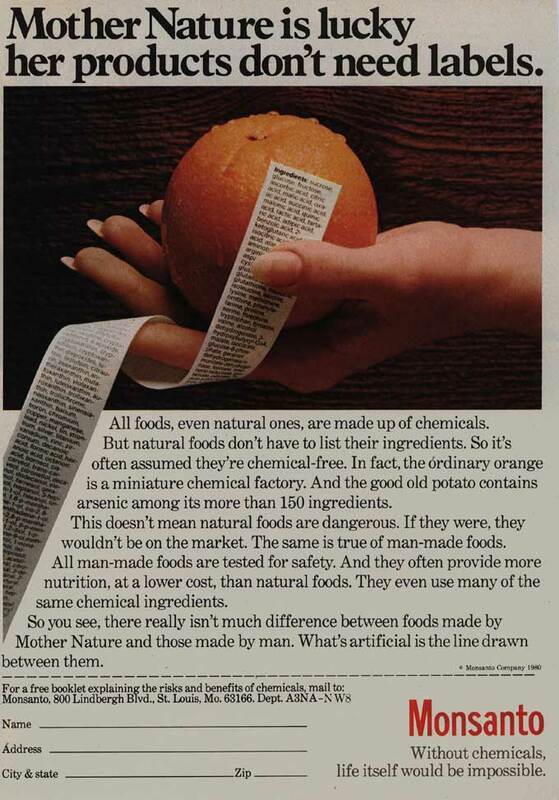 Apparently, concern over ingredients became common enough that Monsanto felt it necessary to produce this 1980 magazine ad as part of its campaign, "Without chemicals, life itself would be impossible." Lest your students conclude that one can find nothing healthful at fast food restaurants, have them read and discuss What's Left to Eat? (from the CSPI Nutrition Action Health Letter, November 1997). You can also have students juxtapose an ad (video, audio or print) for a processed food product with its nutrition facts and/or ingredients list. Discuss what relationship, if any, the message in the ad has to the contents of the product. Of what value is the ad to the consumer? To the producer? Upton Sinclair's novel The Jungle looked into America's food processing industry for the first time. On April 9-10, 2001, The Washington Post published a two-part series on the health and ethical issues involving American meatpacking plants. CAVEAT: These articles contain very powerful, frequently disturbing passages. Information like that found here might make one consider veganism. However it appears that even if the entire human population became vegan, animal death and suffering at the hands of humans might actually increase. For an absolutely engaging look at the philosophical issues surrounding the relationship between humans and other animals, read Michael Pollan's An Animal's Place in the November 10, 2002 New York Times Magazine (free registration required for access to the article). On May 14, 2002, The Washington Post published Healthy Fast Food -- For Adults by Jennifer L Huget, a review of CSPI's new book Restaurant Confidential (Workman 2002), an analysis of the nutritional content of fast food restaurant fare. The article contains a link to a very useful fast food calorie counter. However, before you can use it, you'll need to have Macromedia's Flash 6 (or later) browser plug-in installed for your browser. On May 4, 2003, the New York Times published The Futures of Food, Michael Pollan's brilliant look at how our idea of what food will be like in the future has changed over the past 40 years. On April 18, 2002, Frontline broadcast the program Modern Meat. You and/or your students can read the transcript online. I was inspired to develop this activity after reading and using the Eater's Test that opens Jeffrey Schrank's The Grocery Book (Learning Seed Company 1979, now out of print). While The Grocery Book is no longer available, Schrank's Learning Seed Company creates and sells marvelous videos (here is a link to videos about food and nutrition). Here are links to other Classroomtools.com ideas dealing with food and nutrition. How much sugar does the average American consume in one year? What percent of the U.S. population is actually overweight? copyright © 2001-2010 classroomtools.com. All Rights Reserved.